All transactions are safe and secure with a reliable history in online purchasing behind each of our associates. Buy the Boondock Saints MacManus Brothers t-shirt to own Boondock Saints clothing and merchandise. 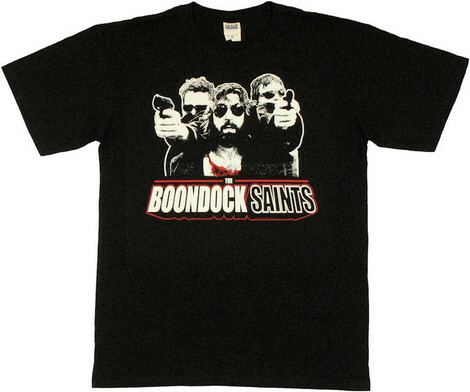 This Murphy and Connor Boondock Saints t-shirt displays an image of the two brothers in a shootout. The perspective of the picture makes it seem as if the MacManus brothers are standing over the observer of the image. Murphy and Connor (Norman Reedus and Sean Patrick Flanery) are wearing black coats. They are standing with their guns drawn ready to defend justice as soon as they recite the Boondock Saints prayer. Look for similar Boondock hoodies. In addition to the Boondock Saints MacManus Brothers tee above, browse the Boondock Saints Clothing Gallery for more apparel like men's and women's clothes, kids shirts or hoodies.